Blog writing is crucial for a digital marketing strategy. And writing blog articles is quite… frustrating. You might be thinking: “What am I, a journalist?”. Except if you are a journalist. Then, good on you, this part of content marketing should be a breeze. For everyone else - it’s okay if you’re not a journalist. Neither am I. But writing blog articles is for everyone, and it can be quite easy if you have a blogging guide. So, if you want to find out how to write an article, keep on reading, because in this blog post we’ll discuss everything about writing a blog post. Woah, is this Inception? And, yeah - you’ve guessed it. We have a canvas to share with you! If you have an article idea in mind, you can download the canvas and fill it in as you read. Before we jump into filling in the canvas, let’s discuss about what content marketing is and why it’s important for a business. That means that you provide content to get people interested in your brand. But what do you mean by content? A ton of stuff can be defined as content: blog articles, video content, case studies, white papers, ebooks, infographics, checklists etc. Blogging is the most popular type of content, and with good reason. According to a study on US consumers, 81% of people believe that blogs are trusted sources of information and advice. It’s also cheap - the only resource you need is time. Well, and an internet connection. But the important thing is to provide relevant content for your target audience, both regarding topic and format. Whatever type of content you choose to create, you need to provide it consistently. But that sounds like a lot of work. Yup. It certainly is. Yet, brands all over the world use content marketing, so they must be onto something. Let’s see why creating content worth your time. Check out this stat: the average company that blogs generates 55% more website visitors. Why though? You know how flowers have colorful petals so they can attract bees to pollinate them? Well… the blog is your pretty colorful flower. It attracts visitors to your website through helpful content. Some of the people that visit your blog will likely visit other parts of your website and even purchase from you. Sharing your knowledge on a certain subject helps not only to show your expertise on a certain subject, but it actually creates a relationship of trust between you and your customers. Don’t believe me? According to Demand Metric, 82% of consumers feel more positive about a company after reading custom content. And it makes sense. If you help your customers learn about a topic they’re interested in, they can see you’re invested in their well being, not just selling stuff to them. Another stat from Demand Metric says that 78% of consumers perceive a relationship between themselves and a company that uses custom content. This stat makes complete sense to me. It made me instantly think about a few companies that I feel like I have a relationship with. Why? Because I trust them. Why do I trust them? Because they produce great content I’m interested in, and their blogs are my go-to places whenever I’m searching for something in their wheelhouse. I’m sure you can think of at least one company like this as well. And why do you want a stronger relationship with your customers? Well, let’s put it this way: depending on the industry you’re in, gaining a new customers is 5 to 25 times more expensive than retaining an existing one. Yup. Content marketing saves you money. Now that we know what content marketing is, let’s talk a bit about a complementary marketing technique that we’re going to use while filling in our blog article canvas: SEO. Every marketer (myself included) will tell you that you can’t write blog articles without SEO. Sadly, we will not cover a lot of SEO concepts in this article, or it would turn into a book. Or book series? Anyways. If you don’t know much about SEO, check out this very popular article from Neil Patel explaining it. If you put in practice SEO principles for your blog post it will be more likely to appear in the first page results. So, to put it simply, search engine optimization is important because it helps people find your website. Well, enough with the Marketing 101 lecture. 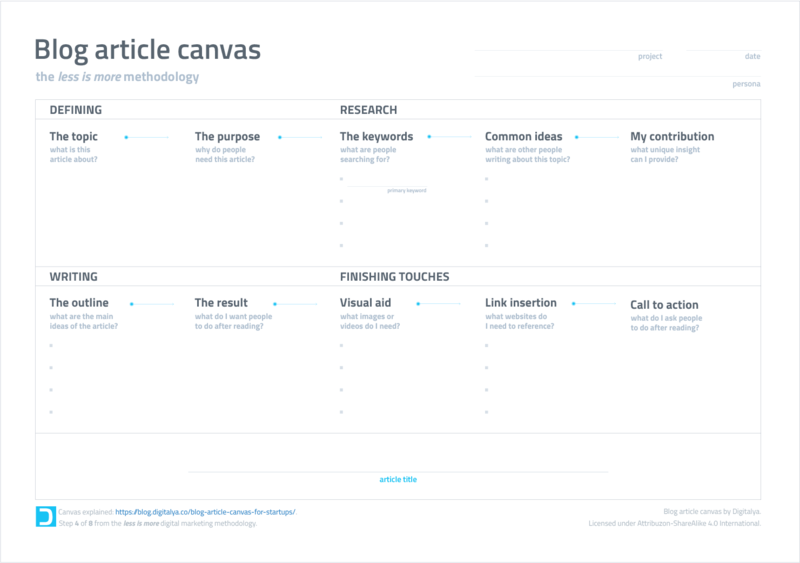 I wouldn’t want you to fall asleep, so let’s get to the juicy stuff - filling in the blog article canvas. You should start with defining what you’re going to write about and why you are writing it. For this section… Actually, scratch that. For the entire article, it’s essential to have your buyer persona defined. If you haven’t done that already, check out our first article of the series. Now, let’s start with the first step. 1. The topic - what is this article about? Is it helpful to my client? Will it help me fulfill my business goals? We have a flight booking software and our buyer persona is Daniel, a 35 years old businessman that is extremely busy, but he also loves to travel. While he might also be interested in business tips in his industry, that’s not the type of content we want to provide for him. Because that won’t determine him to book flights on our platform (which is our business goal). The topic we’ll tackle is must see places in the world, because Daniel loves to travel and is curious about this subject, but also because the article might sway him to book a flight on the spot to one of those places. 2. The purpose – why do people need this article? Before moving forward, you have to clearly define the reason for which your buyer persona would want to read this article. This will give your article a purpose, which will give you a clear path to follow when writing it. Try to put yourself in your buyer persona’s shoes. What is their day like? What do they struggle with? What would make him/her stop scrolling and click on your article? We established that Daniel is interested in travelling articles, but he might not want to read every article out there related to travelling. So, what else do we know? Oh, yeah! He doesn’t have a lot of free time. So the reason they’ll read this article it’s because it narrows down all the traveling destinations out there to a must see list of places he might actually be able to visit. 3. The keywords – what are people searching for? Here is when SEO comes into the picture. Knowing the keywords people are using to search for the topic you’re writing on is essential, because you can use them in your title, URL and article body to make it more appealing for search engines to include you in search results. There are a lot of tools you can use to research keywords - Google Keyword Planner, SEMrush, and Moz are some of the more popular ones. At Digitalya, we use Mangools because it suits our needs the best. keyword difficulty - an estimated number from 0 to 100 that tells you how difficult it would be for your website to be in the top results for that keyword. The keywords you’re interested in are the ones that are highly searched for, don’t have a lot of competition and have a low keyword difficulty level. While you shouldn’t include just one keyword in your article, you should choose a primary keyword that has the best combination of the three traits I just mentioned. For our traveling article, we chose as a primary keyword ”places to visit before you die” because it has the lowest keyword difficulty level, very little competition and quite a large amount of searches per month. The other phrases you see there could be used as secondary keywords, which raise the chances of the article being acknowledged by search engines. 4. Common ideas – what are other people writing about this topic? The number of blog posts written every month will shock you. There are more than 77 million blog articles posted last month just on blogs hosted on WordPress.com. Imagine how many blog posts were written everywhere on the Internet. What I’m saying is… it’s very difficult to find a topic nobody wrote about. That’s why you have to find out what other people are writing about on the topic you chose. Do a quick search on Google using your primary keyword to see what pops up when people search for your topic of interest. If you know the location of your clients, you can use the Moz toolbar to see what results appear on the first page in that location. Then, just write down the main ideas the top blogs write about. After searching for “places to visit before you die” on Google US, we saw that people were writing very similar articles in the form of a list with the most beautiful/breathtaking/surreal places in the world. 5. My contribution – what unique insight can I provide? And now… we’ve arrived at the most difficult part of writing a blog post. Finding something unique to talk about. You need to offer the reader a reason why they should read your article, and not somebody else’s. And not only that, but if you write an article that talks exactly about the topic other successful blogs write about, there’s very slim chances Google will offer you a spot in the top results. A unique perspective - well, that’s something even search engines are searching for. Based on the ideas from other articles you’ve just written down, what is there left to talk about? Did you notice a certain idea nobody tackled? Is there a different angle you could take? Can you share a personal experience or opinion that would be helpful to your readers? You could even deliver a different type of article. Give yourself some time to really think about it before you move on to the next part. There’s no way we can compete with Bored Panda or Buzzfeed, two of the top results when our primary keyword is searched on Google. That’s why we’ll offer a different angle on the topic. We’ll talk about must see places in the United States - which is the country our buyer persona lives in. 6. The outline – what are the main ideas of the article? The truth is that blog writing can be quite chaotic. If I wrote everything I wanted in this blog post, it would probably be thrice as long. And it’s pretty long already. I’ll admit, I’m kind of a chatterbox. Without having a structured list of what I want to touch on, this blog article wouldn’t just be too long, but it would actually be very difficult to read. That’s why you should write down the main ideas of your article, so you can focus on what’s essential to talk about. Having a structure will actually save you time when writing as well, because you won’t have to stare at a blank page thinking: “What do I start with?”. Conclusion: reinforce the ideas from the intro and ask for the reader’s opinion on traveling locally. 7. The result – what do I want people to do after reading? The sole purpose of writing blog articles is to help people out. No matter the topic, no matter the post type, no matter the author. In some way or another, it helps people do something - create something, form an opinion, do their job, relax etc. So… what do you want people to do after reading your article? Now, go ahead and write down the result of your article. Maybe write it on a Post it and stick it to your monitor so you can see it while you’re writing your article. After finishing a section of the article, ask yourself: Is this information going to help my readers get to the result I want? If the answer is no, then you should probably get rid of it. We want people to realize that, even if they have a busy lifestyle, they can still visit beautiful places. That’s different from our business objective, because it focuses on the reader and bringing value to their life. 8. Visual aid – what images or videos do I need? This step is pretty straight forward. Is there any image or video you need to insert into your article to better convey your message? The answer is probably yes, so write down whatever visual aid you need, so you can later include it in the article. However, if the answer is no, I encourage you to still think about including at least an image or two, depending on how long your article is. Images and videos not only help your readers understand the information better, but it actually makes the article easier to read, as opposed to a bland block of text. Of course, there are plenty of blog articles out there with no photos. However, according to Hubspot, 43% of people admit they skim blog posts. So, if you decide you don’t need visual aid, don’t forget to use bold to point out important information, or to use bullet points and numbered lists to make the article easier to skim through. We need an image for each place we mention in the article, so the readers can see why those places are unique. 9. Link insertion – what websites do I need to reference? This is the part where you consider if you can reference any websites in your article that would be useful to your reader. For instance, if you mention a brand in your article, you should link to it, so that your reader can find out more information about it if they’re interested. You can see this principle applied above, when I told you about a few popular tools for keyword research. In case you were curious about what each do, you could just click on the name of the brand and go to their official website. If there’s a topic you can’t cover in your article, link to an article that you have read and you trust will be helpful for your readers. Remember that article from Neil Patel about SEO? Yup. Just like that. If you insert statistics, link to the source - it makes it more credible. Remember the statistics about WordPress blog posts? Alright, you get it by now. Don’t forget to link to your own articles as well. If there’s an article you wrote that would be helpful for your readers, there’s no harm in linking to it. Creating a network of articles will not only be helpful for your readers, but for your website traffic as well. For our traveling article, we’ll link to any place that has an official website with more information, as well as a guide written on our blog about planning a vacation. 10. Call to action – what do I ask people to do after reading? Remember in the beginning when we talked about defining business objectives for your article? Well, with that business objective in mind you need to create a call to action. A call to action is a stimulus that you can use to urge people to do a certain action. A great incentive is to also provide people with an offer, like a sale, complementary product/service or free resource. Because our business objective is to determine readers to book a flight to one of the places we recommend, we’ll include a call to action in the form of “Book a flight”. We’ll add an incentive of 10% off if they book a ticket to one of the places mentioned in the blog post. Now that you have the blueprint of your blog post, you can write your article title. It’s very important to include your primary keyword in the title - and, if possible, try to include it as close to the beginning as possible (for SEO purposes). However, don’t forget you’re writing for humans, not search engines - so if writing your title this way makes you sacrifice the coherence of your title, then forget about it. For more tips on how to write a blog post title, you can check out this article - I found it pretty useful. Our article title will be: “7 stunning places in the United States you have to visit before you die”. If you want some inspiration while writing your own blog post, you can download this example here. After filling in all of the sections in this blog article canvas, you will have a detailed blueprint that will help you will create a useful blog article both for your readers and your business. I hope this guide on how to write an article for a business blog helped you out. Don’t forget to have fun while writing and let your personality show through! Well, boys and girls, we just wrote an article together. Pretty awesome, huh? If you haven’t downloaded our canvas yet, you can do so below. Also, if you want to be notified when a new article is written on our blog, you can subscribe to our newsletter.